IDEAL MARRIED LIFE NO MORE ... REALITY MAYBE! In Marriage there's no perfection and absolutely there's only one thing right - Mrs. Always Right! In reality, for couples, excuse me i should say for husbands don't waste your time, no explanations needed, no nothing, right, that's right - you'll never be right. 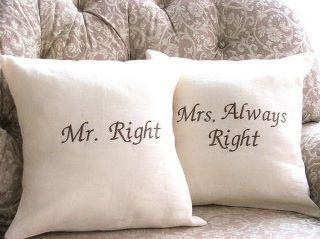 If there's one thing that should never be forgotten, take it from an idiot: your wife will always be right! Greetings to all fathers out there!